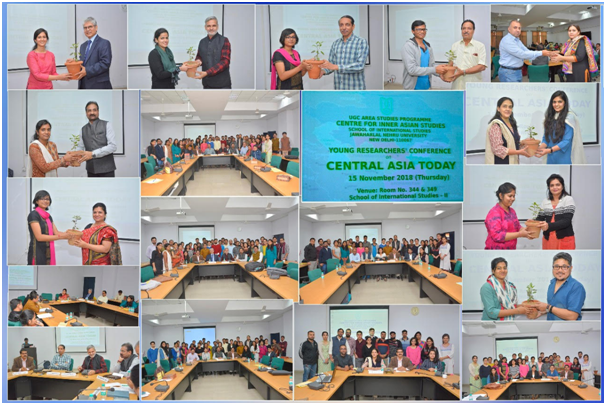 The Centre for Inner Asian Studies (CIAS), School of International Studies, Jawaharlal Nehru University takes immense pleasure to share that the UGC Area Studies Programme recently concluded a Young Researchers’ Conference themed on ‘Central Asia Today’ on 15 November 2018. Divided into five sessions on a variety of issues, a total of 34 research scholars presented their papers encompassing diverse topics, issues, ideas and analyses. The conference was inaugurated by Chief Guest of the event Prof. M. Jagadesh Kumar, Vice Chancellor, Jawaharlal Nehru University, with welcome address by Prof. Sharad K. Soni, Chairperson, CIAS. With keynote address by Prof. Chintamani Mahapatra, Rector, Jawaharlal Nehru University where he gave a macro view of Central Asia and its location in the world politics. Dr. Ambrish Dhaka, CIAS, SIS gave the formal vote of thanks. With this enlightening session, the conference began with full fervor. The first academic session was themed on “Society, Politics and Economy in Central Asia” which was chaired by Prof. Sharad K. Soni. A diverse range of papers were presented which dealt with globalization and regional security in Central Asia, prospects and challenges of regional cooperation in Central Asia, new regionalism in Central Asia and major powers, success of globalization experiment in Kazakhstan and labour migration in Central Asia. The parallel session was themed on “religious revivalism, extremism and terrorism in Central Asia” and chaired by Dr. Preeti Das, Centre for Russian and Central Asian Studies, SIS, JNU. Regional and national issues regarding the theme was presented in the session which includes the relevance of revivalism to radicalisation with comparative study of Central and West Asia, Islamic Movement of Uzbekistan as a security threat to Central Asia, Taliban-IMU-ISIS nexus, Central Asia’s influence in religious extremism in Xinjiang and narcotics as non-traditional security issue in Central Asia. The second session was themed on “Central Asia and its neighbourhood”, chaired by Dr. Sheetal Sharma, Centre for European Studies, SIS, JNU. Various neighbours and global power presence in Central Asia were dealt in the paper presentations covering topics such as Russian foreign policy towards Central Asia, China’s role as pivot of “New Great Game”, Afghanistan and Central Asian ethnicities, Central Asia’s relations with Iran, and Xinjiang. The third academic session, themed on “water, environment and climate in Central Asia”, was chaired by Prof. Sangeeta Thapliyal, CIAS, SIS, JNU. Water being a vital and crucial resource in Central Asian region was largely discussed through issues such as water as non-traditional security threat, water conflicts and diplomacy, water war leading to crisis, Aral Sea crisis, environment degradation and health hazards. The session was thoroughly interactive as water as a source of conflict in the region has been highly debatable. The parallel session was themed on “Central Asia and India”, being chaired by Dr. Tsetan Namgyal, CIAS, SIS, JNU. Papers covering multiple dimensions of Central Asia and India Relations were presented which include Central Asia-India historical links, regional geopolitics, challenges and opportunities, India’s attempts to expand Influence in Central Asia, strategies and prospects of India’s economic engagement in Central Asia, India’s connect Central Asia policy, India-Tajikistan relation and its defence, security and strategic dimensions. Regional cooperation as well bilateral relations were dealt through these papers . The final session of the conference was graced by Ambassador Ashok Mukherji as the valedictory speaker and chaired by Prof. Chintamani Mahapatra, Rector, JNU. Ambassador Ashok Mukherji shared his vast experience as a diplomat and explained the importance of linkages in diplomacy. He also emphasized on the role of education and field visit in acquiring the basic knowledge of a country. He emphasized on the new regime in Uzbekistan which could be a watershed moment for the region. He also explained the role of Turkey and Saudi Arabia in the Central Asia. About India and Central Asia, he suggested that India should focus on manufacturing in the region as well and Buddhism and Sufism can be used for the revival of India-Central Asia relations. Dr. Mahesh Ranjan Debata, Director, UGC Area Studies Programme, CIAS and coordinator of this conference, gave the vote of thanks. With this, the conference was concluded with sharing of knowledge, research and ideas by young doctoral scholars, faculty and guests. Dr. Mukesh K. Mishra, Research Associate, UGC ASP, CIAS and seven doctoral research scholars of CIAS (Mr. Rohit Kumar, Ms. Amina Bibi, Mr. Abhijeet, Mr. Narendra Sharma, Ms. Pooja Singh, Mr. Anand Gupta and Ms. Shubhra Kumar) assisted in preparing the rapporteurs’ report.